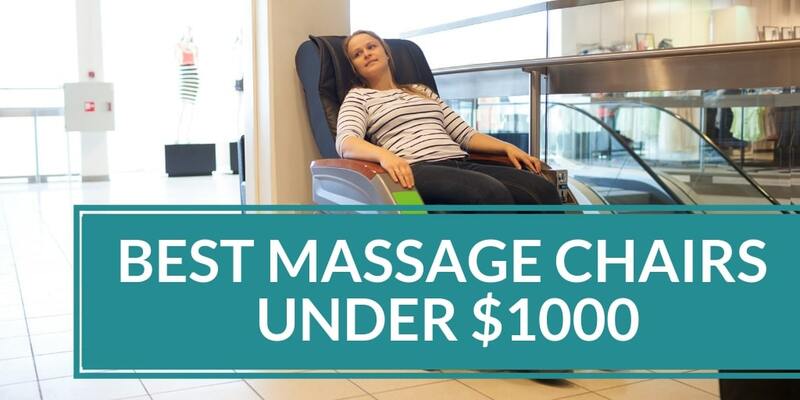 The best buy massage recliner to keep your work team stress-free throughout the day! Is the stress piling up on your work team? Are you looking for a way to ensure they remain stress free and productive throughout their work day? Do you also need something wallet friendly, but that would still serve the purpose? 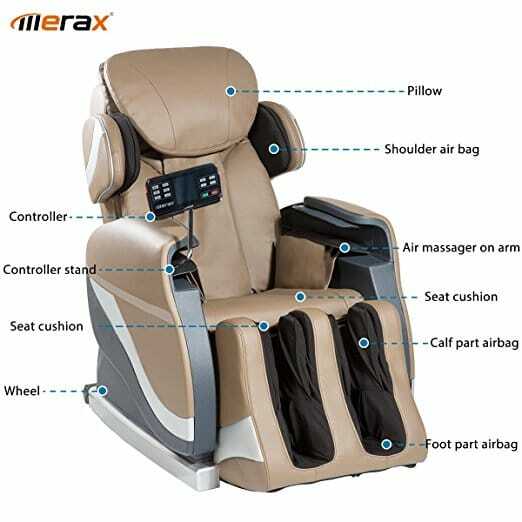 Look no further, the Merax Full Body Massage Recliner is here to solve all these problems and more. 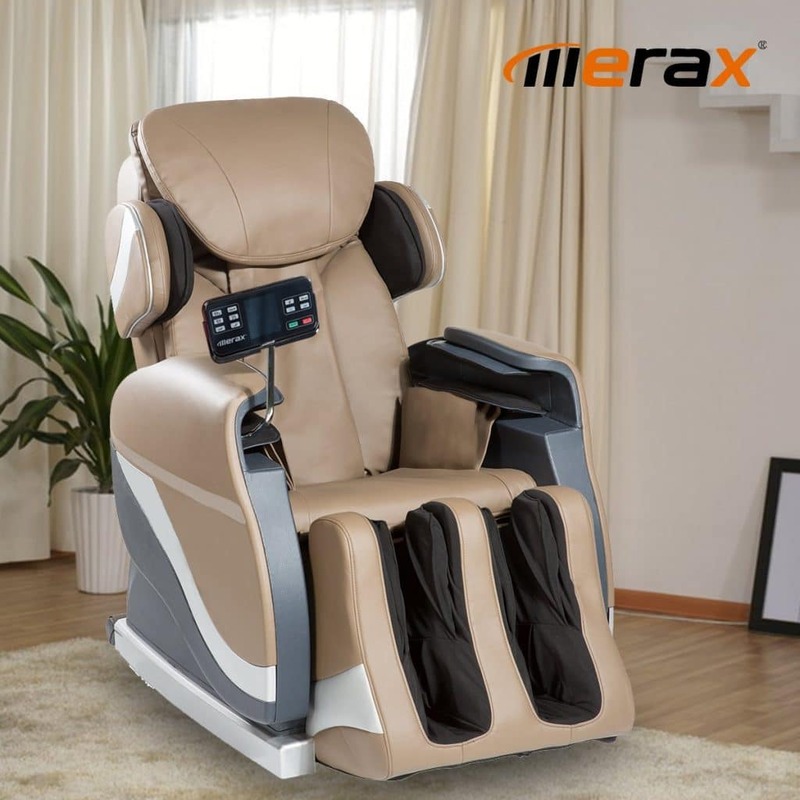 Whether you’re in need of a full body stretch or pressure relief on your neck and shoulders, the Merax Full Body Massage Recliner fulfils all your needs. Featuring a two-way massage system and stretch program, it ensures your body receives the ultimate in relaxation treatment to keep you going through your day be it at home or in the office. 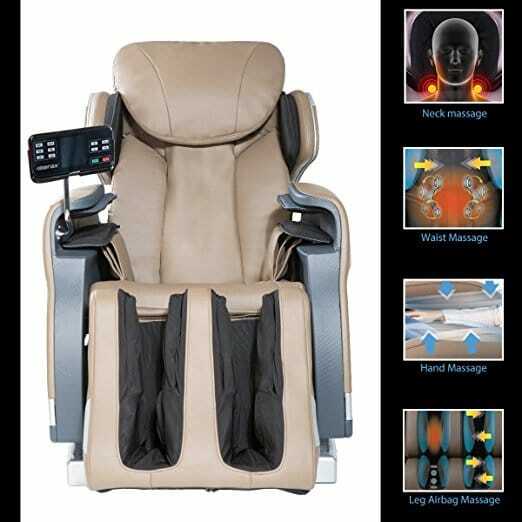 The Merax Full Body Massage Recliner is an electric leather lounge massage chair that offers up to 8 massage programs designed to put your mind, body and soul at easy, whatever environment you are in. This advanced technology consists of a highly unique design, where the system covers a majority of the surface area with the least amount of air cells possible. The air cells are strategically placed in the shoulders, arms, seat, legs and feet and are specially programmed to inflate separately, causing the body to twist and deep stretch. Combined with the in-built feet rollers, the result is a quality massage that leaves the user feeling refreshed and replenished. 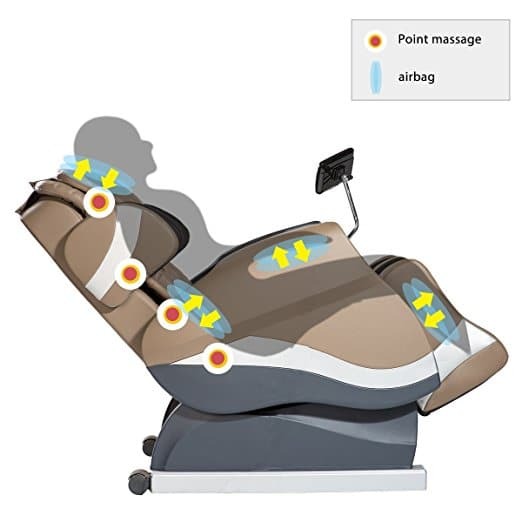 While most other massage chairs also utilize the kneading technique, the Merax Full Body Massage Recliner offers kneading both inward and outward to act on your acupressure points and offer more targeted relief. 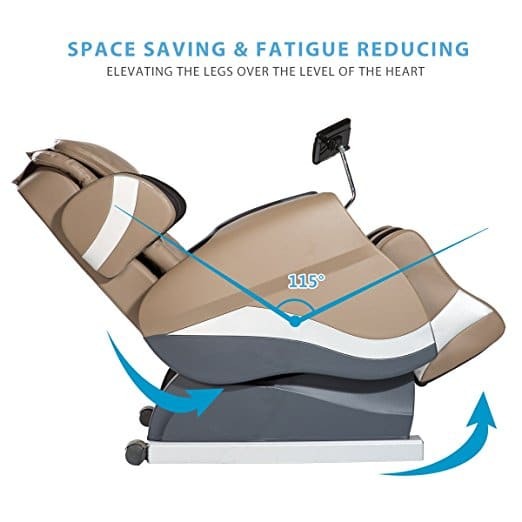 This is also referred to as the “spinal decompression” program, and is a form of therapy that utilizes a specially designed pattern/routine that is applied by the air cells in the chair that pins your body in place and carefully stretches out your muscles to achieve the best possible relaxation and stress buster. This chair features a body shape detection technology that enables the chair to identify and distinguish between body shapes and therefore offer more targeted comfort to the user. The focus here is on deep tissue in the neck and shoulders, where the chair works to apply the right amount of pressure to soothe and replenish muscles. 8 massage programs for 8 different focus points along your body, from your neck to back to lumbar area. Easy to use remote with large viewing screen that helps you better visualize the ongoing chair functionality. 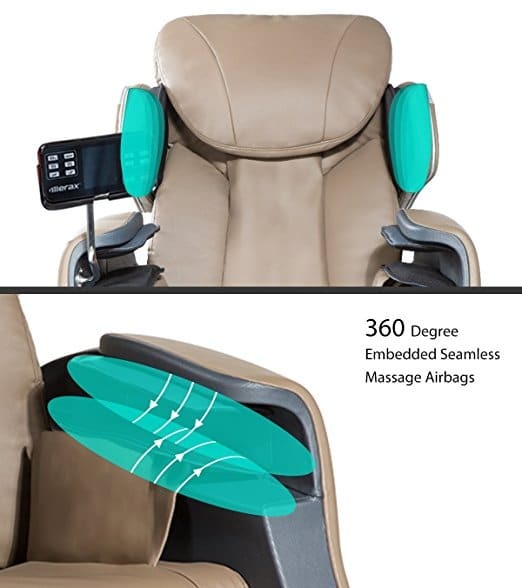 3 levels of back massage intensity and up to 5 levels of intensity from the air bag technology. 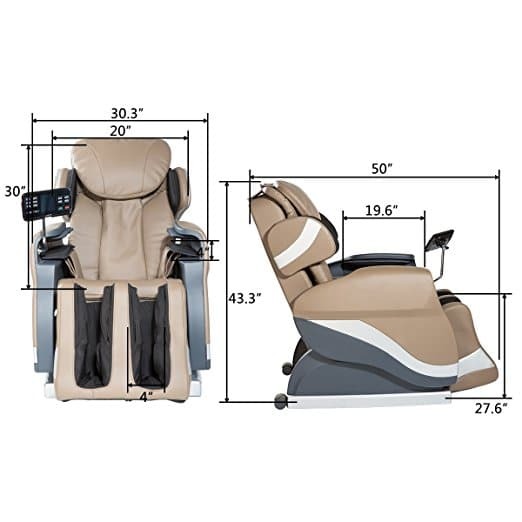 Auto recliner and leg extension allow for a rising and reclining mode that stretches your muscles and joints to relieve tension and build strength. Installation can be time-consuming and a bit tricky if not done right. If you decide that this chair is not for you, there are lots of other choices out there. You can try the Kahuna LM-6800, Forever Rest FR-5Ks, RelaxOnChair MK-IV, Osaki OS-4000, Real Relax or Synca Wellness CirC. 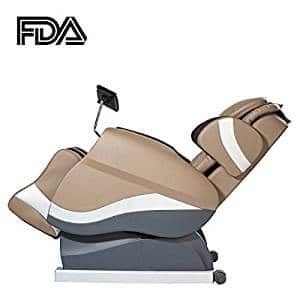 The Merax Full Body Massage Recliner is your new best friend at work, not just for you but for your co-workers as well. Feel the benefits of air cell technology and deep tissue relief therapy, and allow the two-way massage system to work its magic on your sore muscles to get rid of those kinks and knots and provide you with the ultimate stress buster, at any time of the day or night.